Is it surprising that we fell head over heels for the fashion from the "City of Love"? I think not. Call me a crazy American, but there's something dreamy about sporting a chic look at the cafe on the corner while nibbling on French pastries. I mean c'mon... You're lying to yourself if you aren't thinking the same thing. So how exactly can we dress like a Parisian wherever we are? It's quite simple actually. By sticking to these guidelines, you'll be looking like you belong at the Parc du Champ de Mars in no time. Not the super obnoxious carnival type... Gross. I'm talking sleek striped tops and pants (vertical stripes for the win). 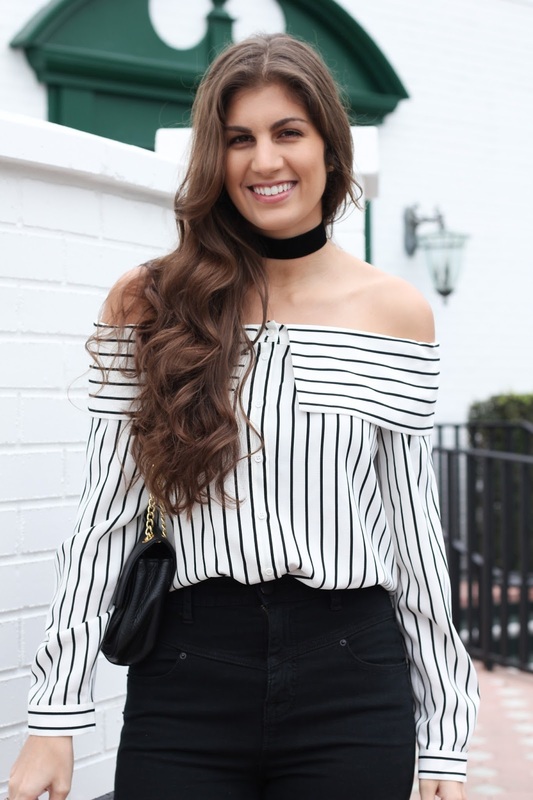 Black and white stripes are almost as classic as the French beret, but you can mix this up by wearing interesting silhouettes like wide-leg pants or an off-the-shoulder blouse. Even though I'm a Florida girl, this is one of my basic rules when shopping. While the rest of the crowd around me is sporting brights and crazy patterns, I'll be sporting my neutral shades all day, every single day. Parisian women are laid back and their confidence shows regardless of what they're wearing - no loud colors needed. You know that acronym that we all learned when we were in grade school, K.I.S.S? Let me break it down to the newcomers (and sorry to burst your bubble if you thought it had to do with smooches): Keep It Simple Stupid. Think of that as you're getting dressed! Keep your accessories to a minimum and don't overload with too many pieces. P.S. Flats are key. Toss out those items in your closet that you rarely ever wear, and stock up on the classics. You've heard about them 100 times... do you still not have them in your wardrobe? Today's the day! Dress for success with a white button-down, chic trench, oversized sunglasses and crisp blazer. Some of you may be thinking, "but it looks so masculine!" If this is you, you're probably doing it wrong. Menswear-inspired pieces can be some of the best to have in your closet. Oversized shirts, trousers, loafers (so on trend right now!) and the structured blazer are your best friends. The way to make this work is to blend them appropriately with some of your other favorites! Try out your button-down, dark jeans, a blazer and loafers - aka my fav daily uniform. Now get out there and work on your French!